Includes use of laryngoscopy and stroboscopy to view the voice box, vocal tract and sinuses. Full analysis of voice production and vocal technique. Video recording provides visual and auditory feedback for the individual, speech pathologist, singing teacher or vocal coach. A diagnosis and management plan that utilises the five components of voice: Vocal skill, vocal use and lifestyle, medical issues, emotional issues, and body/mind connection. Therapy for stress, anxiety, emotional overload, performance energy, muscle tension dysphonia, etc and support for chronic vocal conditions and psychogenic voice disorders. Specialised examination and advice for singers, actors, performers and teachers, with treatment plans that respect and incorporate your particular needs. 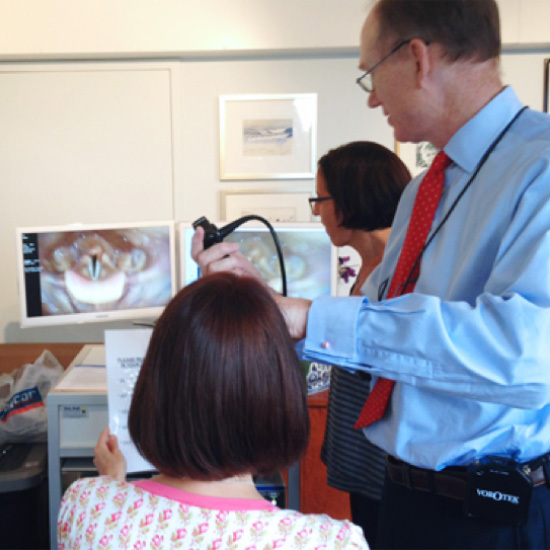 Consisting of surgeon Jonathan Livesey, speech pathologist Karin Isman or Andy Kilov and counsellor Jan Cullis, the examination involves spraying your nose with a local anaesthetic to numb and open you nose and throat. A very small flexible telescope is gently passed through your nose in order to comfortably view your voice box whilst you speak or sing. We will ask you to do various vocal tasks to enable us to see how your voice box is behaving. We can then make a diagnosis, answer your questions and develop a management plan with you. Voice therapy plays a critical role in the management of many voice disorders and has been proven to be effective in the treatment of hoarseness in both children and adults. Voice therapy involves a series of vocal and behavioural exercises designed to eliminate harmful vocal habits, shape healthy vocal technique, and assist in vocal fold wound healing after surgery or injury. Voice therapy generally consists of 4-6 sessions but the duration is determined by the origin of the hoarseness and severity of the problem, co-occurring medical/psychological issues, and importantly, patient commitment to the practice. The purpose of voice therapy is to help you attain the best possible voice and the most relief from the vocal symptoms that are concerning you. Symptoms vary from patient to patient, and so the goals of your voice therapy program are tailored to your personal needs. Tonsillitis is a very painful and incapacitating condition. Singers and other voice professionals are often very concerned about surgery on their throat. In Dr. Jonathan Livesey’s experience there are no long term problems with tonsillectomy in singers and other voice professionals. Singers can consider returning to full performance after six weeks. Jonathan also cares for adults and children with deafness, glue ear, tonsillitis, upper airways obstruction causing snoring or sleep apnea. Singers and other voice professionals can have great difficulties with sinusitis and nasal obstruction for various reasons. Dr. Jonathan Livesey is experienced in the care of nasal and sinus conditions including recurrent sinusitis, nasal obstruction and nasal polyps or nose bleeds (epistaxis). These may require medical or surgical treatment including functional endoscopic sinus surgery (FESS), polypectomy or septoplasty with turbinoplasty. Understandable professional voice users are very worried about having an anaesthetic tube in their voice box. This should be discussed with your surgeon and anaesthetist. For many procedures it is safe to use a laryngeal mask (LMA) rather than an endotracheal tube (ETT) between your vocal folds. However, sometimes an ETT is essential. The anaesthetist is the final judge and will place either tube very carefully. You may have some questions, we may have the answers! Head over to our FAQ page to find out.